At Local Government Reorganisation in 1974, Lancaster merged with Morecambe & Heysham to form a ‘new’ Lancaster City Transport. The operator found itself short of modern, serviceable, vehicles and some were acquired from Maidstone Borough, some from what had become Burnley & Pendle, one from Merthyr Tydfil, and there was even a Seddon (ex Demonstrator) which has appeared on these pages already. LHG 537 is one of the Burnley contingent, a Titan PD3/6 with East Lancs H73F body, dating from 1961. In this view, she is climbing the hill of Great John Street, towards Lancaster Town Hall, on the 2 to Hala. It is 20 May 1975 and she is still in the Burnley arrangement of maroon and cream – not a great deal different from the Lancaster arrangement – with fleetname in Tilling style. Lancaster also bought a lowbridge Atlantean from Trent and a number of ex Salford ones from GMTPTE In addition an ex Wallace Arnold Leyland Leopard was bought from Fishwick. Pete is quite correct when he says that the enlarged Lancaster undertaking was short of modern vehicles, much of the fleet comprising ageing AEC Regents at Morecambe. What is quite amusing though is that the "modern" fleet additions he mentions comprised of a variety of buses built between 1957 and 1961, so on arriving around 1974 were somewhat long in the tooth themselves! 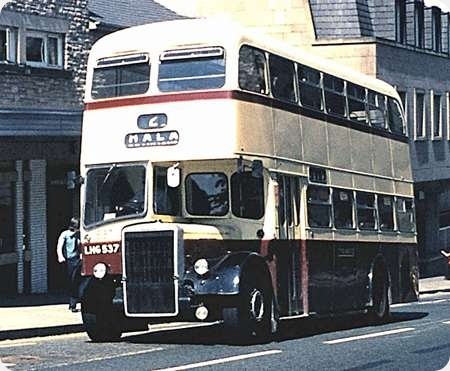 The one depicted – and its sisters – were never used as OPO buses in Lancaster and nor were they in Burnley. However, the window to the left and behind the driver appears to have been modified, presumably for the purpose of OPO – and I note the unusual position of the mirror underneath the second ‘A’ of the destination, presumably to give the driver a view of the lower saloon/platform area with a view to being used single-manned. This batch of PD3’s had the front bulkhead window arrangement from new. It was a common arrangement on early forward entrance double deckers to allow drivers to see the platform and communicate with the conductor but OPO of double deckers was at that time a long way off becoming legal. The arrangement was tidied up on later designs with the whole front window being angled to avoid the two-piece window. After this it became less noticeable. LTC 109F fleet number 109 is a Leyland Panther PSUR1/1R with East Lancs B53F body, new to Lancaster in 1968. The batch was in maroon and cream livery then, but we see it in ‘post merger’ livery of blue and white, on the sunny evening of 20 May 1975. The scene is Lancaster’s Damside Street Bus Station. 389 JTD a 1959 Tiger Cub is behind, still in the old livery but with the Tilling style of fleetname adopted as an interim measure for Lancaster and Morecambe & Heysham vehicles, together with what looks like another Panther on the extreme left of the view. In late 1979 LTC 109F came to Derbyshire when, in company with Morecambe and Heysham AEC Swift UTJ 908H, it joined Woolliscroft Silver Service fleet at Darley Dale. Initially they were on loan from Lancaster City but were purchased outright soon after arrival. The Panther bore a strong family resemblance to a batch of Neepsend bodied Panthers at nearby Chesterfield, these Neepsend bodies being built under license from East Lancs. LTC 109F lasted a couple of years but was eventually stripped for spares and the remains had been scrapped by 1982. The Swift lasted a little longer going to North at Sherburn in 1983. My original slide includes the Ribble PD3 with Metropolitan Cammell body which some members may have spotted on the extreme right It is from the PCK series. Lancaster had six of these Panthers, in two trios: GTC 104-106F from 1967 and 107-109F from 1968. David comments on a number of supposed ‘East Lancs’ products being bodied by Neepsend. Some of Southampton’s later Regent V fleet were products of this arrangement and I think I’ve read somewhere that many think Neepsend was a subsidiary of East Lancs, but they were in fact part of the same group. Wrong again, Davies? Just a clarification re. Pete’s comment, the registrations of the second batch of three Panthers were LTC-F.
Lancaster reverted to Leopards for its next deliveries. Thanks, Dave. I must fire my proof reader! East Lancs were owned at the time by John Brown engineering who were based originally in Sheffield They re activated bus building in Sheffield at a factory on Neepsend Lane using East Lancs designs. So really Neepsend were never an East Lancs subsidiary but both were part of the John Brown empire. Sheffield took some rear engine chassis from them in 1964/65 The firm (I think) built one more body on a Bedford VAS chassis for Sheffield but by this time it was called Cravens Homalloy. Thanks, Chris. I’m glad that the old grey cells have not failed me this time. 998 AKT is a Leyland Titan PD2/30, was new to Maidstone Corporation in 1957, with fleet number 8. She has Massey H61R body. In 1975, she and three sisters returned to their birthplace in the north west to join Lancaster City Council’s Transport Department, after the merger with Morecambe & Heysham in 1974. The new Council had a flurry of buying used vehicles in 1974/5, and Maidstone 8 followed the old Lancaster pattern of matching the fleet number with the registration, becoming 998. In this view, taken on 13 September 1975, she is westbound near the Grand Hotel, on Morecambe Promenade. There seemed to be something about Massey bodies and the seaside. Operators on or near the coast that had them that come to mind are Morecambe & Heysham, Lytham St Annes, Birkenhead, Great Yarmouth, Lowestoft and Barrow-in-Furness. Chester, Colchester, Ipswich and Exeter aren’t that far off the sea either being on tidal estuaries. Lancaster City Council had been told by the Traffic Commissioner that the 1940s and early 1950s AEC Regents inherited from Morecambe were unacceptably old and that was the main reason for the secondhand buys. Maidstone around the same time had a new broom General Manager who was convinced that the town didn’t need heavyweight double deck buses and the same job could be done by a fleet of lightweight single deck Bedfords. Thank you for your thoughts, Philip and Stephen. If I remember rightly, what Stephen says would account for the views I have seen of Maidstone Atlanteans with operators in the Glasgow area. Incidentally, the building site in the background, in the process of becoming a block of apartments, was rather controversial, being at the Promenade end of Princes Crescent. There were rumblings at the time of ‘deals’ between the developer and Morecambe & Heysham’s Town Clerk, who was about to become redundant through the Reorganisation. He had long been in dispute with his employers over his address. He was supposed to live within the Borough, but lived just outside it, in Hest Bank. His mother lived within the borough, and he had his post delivered there. The Captcha code seems vaguely akin to a Rochdale registration: RDK7 . . . This vehicle had been on hire to Alder Valley at Reading the previous year. What a superb livery! 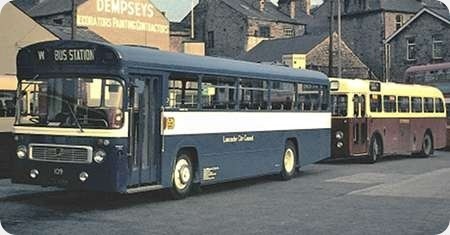 This livery would certainly lift modern double deckers, as opposed to the random ramblings that pass as liveries today. Let’s not forget Southend-on-Sea, too, Philip, with the livery colours of both fleets not being too dissimilar! Further to Allan White’s comment. 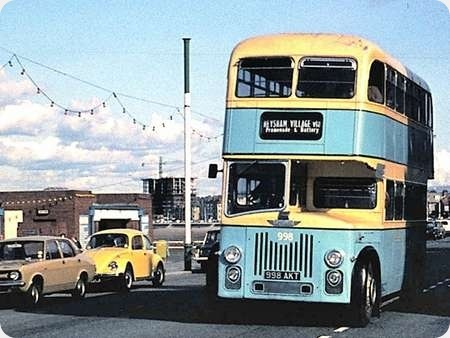 At the time the fiesta blue and cream Maidstone livery was new, having been introduced with the trolleybus Replacement Atlanteans. After a green and cream livery, the GM’s choice, was rejected the Lancaster city fleet was painted Trafalgar Blue and white. Yes, Allan, it certainly beats Maidstone’s previous brown. In the mid-1970s I knew both the Lancaster Chief Engineer and the depot foreman at Morecambe, and did not hear any suggestion that they were under orders to get rid of the Regent IIIs. I was told that the local examiner was inclined to ‘pull a face’, but that was as far as things ever went. If the relevant bus met the required standards, there wasn’t much anyone could do. Of course, the Regent IIIs weren’t getting any younger, and no doubt costing more to maintain as time went by. I was one of four enthusiasts who purchased No.72 (MTC540) for preservation in 1975, and (for our own interest) we were given a copy of a list of jobs which would have needed to be done for a recertification, which Lancaster had apparently considered. It was an uncomfortably long list, for a vehicle with a very limited life expectancy. The traditional livery at Maidstone was an attractive brown and cream worn by buses and trolleybuses alike. Trolleybus replacement began in 1965, and the new buses introduced the pale blue and cream livery shown in the photo above. In 1974 things changed dramatically at Maidstone when Alan Price became Manager of the transport dept. In that year local government reorganisation saw Maidstone Corporation become the extended Maidstone Borough Council with control over the old rural district councils to the south and east of the former Corporation boundaries. Maidstone then sought run bus services in its new extended area which had hitherto been the province of Maidstone and District, and under the NBC Market Analysis Project, integration did occur under the name "Maidstone Area Bus Services". Until 1974 Maidstone had operated a high quality all double deck fleet. Under its new manager this was quickly replaced with OPO Bedford Y type lightweight single decks and all double deckers had gone from service by 1979. In that year, to commemorate the 75 years of Maidstone municipal transport, a bus was repainted in the old brown/cream livery, and, for a while, this became the new standard again. In the meantime, surplus double deckers that had not been sold were hired out to other operators in that period when British Leyland was falling catastrophically short in the supply of new vehicles and spare parts. As the Maidstone fleet expanded to meet its enlarged aspirations, many second hand vehicles were pressed into service still in the liveries of their previous owners. Then, in October 1986 came deregulation, which, amongst its numerous stupidities, outlawed area operating agreements as being "uncompetitive". Thereupon, Maidstone and M&D became competitors, with the Maidstone business relaunched as Boro’line. A new Best Impressions livery of blue and yellow with red and white trim (to my eye as every bit as grotesque as it sounds) came in at the same time, and double decks, new and second hand, reappeared in the fleet. In entering the new competitive environment, M&D adopted practices that later became the subject of the highly critical Competition Commission enquiry of 1993. To further its expansion, Boro’line succeeded in winning some London Regional Transport contracts. Unfortunately, Boro’line was not entirely adept at costing its operating activities, and began accruing very large debts. The whole business was offered for sale by Maidstone Borough, and Kentish bus took the London contracts early in 1992. A receiver was appointed to sell off the remaining operations but very few takers could be found. Discussions with more than 30 prospective buyers fell through. In the meantime, several buses were repossessed, though services struggled on. The end came in June 1992 with the sale of the of the residual business to Maidstone & District. Joe, you comment on the ‘happy marriage of Maidstone & Morecambe’. I think you mean the very unhappy, shotgun, marriage of Lancaster and Morecambe. So far as the thoughts about open rear platforms, apprentices helping to load the bus and learn the routes go, well, RADICAL isn’t in it! I did some afternoon conducting on some of Southampton’s preserved buses (the operation had by then become Southampton Citybus) during afternoons off from my job with the Council, and was amazed at how many folk said much the same thing: it was nice to have a bus with a conductor, and the engine and entrance where they ought to be. I mentioned this to the MD and he declared the thought to be economic suicide. You’re right, Joe – it won’t catch on! There is an excellent article in Classic Bus 135 (Feb-Mar 2015) on the Lancaster undertaking written by Thomas Knowles who was GM of the combined Lancaster – Morecambe & Heysham operation from its outset. Mr Knowles gives a fairly candid view on some of the problems he encountered in running the newly combined outfit. There are also some excellent photos illustrating the article. No, Phil- the happy marriage of convenience of Maidstone & Morecambe- one with too many buses and one with too few! Not conductors, mind… interns or…runners… pupils… there were/are plenty of jobs where you do or did earn next to nothing for the privilege of learning the job. I don’t think the unions ever saw it this way..
Trafalgar blue is used by Lancaster City Council to this day to paint shelters and stops perhaps they are trying to tell Stagecoach something!